Five months after the eruption of violence that caused three deaths over water contamination concerns in Rathupaswela, Weliweriya, the rubber glove factory that triggered the uproar is being relocated. The water contamination issue is being gradually resolved as the government took action at the start of the New Year to provide relief to Rathupaswela residents. Water supply pipelines are to be provided to the residents at an affordable price. The National Water Supply and Drainage Board (NWSDB) on Monday (January 13) decided to provide water to the affected areas for a concessionary rate of Rs. 3,000. The rate was originally Rs. 17,500, which most of the residents objected to paying. Water Supply Minister Dinesh Gunawardena also agreed to provide the service at a rate of Rs. 2,000 to Samurdhi beneficiaries following a discussion with the Chief Incumbent of the Sri Sambuddhaththa Jayanthi Viharaya in Weliweriya, Ven. Theripaha Sridhamma Thera and the main environmental group that fought for the rights of the people in the area, the Siyane Environment Protection Organisation. P. Roshan, 37, a resident of Weliweriya, said the villagers welcomed the moves. “We were waiting several months for this and now we have been given a good solution,” he said. Protests by the residents against the rubber glove factory exploded last year after a resident tested his well water, claiming that it made those who drank it unwell. The test report issued by the NWSDB stated that the water had a low pH value that indicated high levels of acidity. It warned not to “use the water for drinking purposes without proper treatment”. A protest launched by residents along with Ven. Theripaha Sridhamma Thera on 2 August 2013 resulted in three deaths and injuries to more than 40 people. Although residents and other witnesses, including journalists, claim that the army was responsible for the deaths the court case into the matter is still underway. The factory, which had been closed since last July is currently being shifted to the Biyagama Free Trade Zone after the villagers demanded its removal from the area. 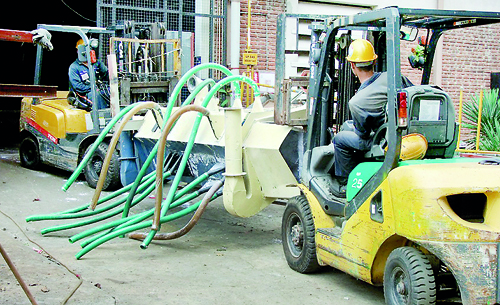 The transport of the factory machinery began about two weeks ago following a decision by Investment Promotion Minister Lakshman Yapa Abeygunawardena last month. “This is what the people in the area always wanted and asked the government to do. After all, it is an issue concerning something as important as drinking water and none of us wanted to see our children and family members falling sick,” Roshan told the Sunday Times. 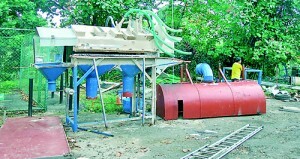 Siyane Environment Protection Organisation Chief Organiser Suresh Perera observed that two of the factory’s five sets of machinery had already been moved out. “There were 24 Grama Sevaka divisions in the area that were affected by this water issue but when the government initially took steps to provide piped water supply the residents refused this, saying what they wanted was to have the factory removed. As a result only 98 families out of the 1000 that were offered the service obtained it,” he said, adding that after this week’s decision residents had agreed to pay the reduced sum to get uncontaminated water to their homes. He said the environmental group and residents were keeping a close watch on the factory along with police inspectors who were deployed in the factory premises. “We will not let them recommence any work in Rathupaswela,” he said. Siyane has taken steps to educate residents about the effects of the contaminated water and encourage them to obtain the alternative water supply provided by the government. He said that while the issue was being worked out groups had been trying to cause agitation among the public for political motives. The Managing Director of Hayleys subsidiary Dipped Products Ltd (the company that runs the rubber gloves factory) Dr. Mahesha Ranasoma said although relocation of the factory had begun the entire ptrocess would take time to complete and he could not name a final departure date. At any rate, he said, the factory had completely ceased production. He said several bodies including the NWSDB, Government Analyst’s department and the Central Environment Authority had been asked to test water and soil samples in and around the factory and issue reports. “None of these reports showed that the factory was responsible for the low pH levels in the water in the area,” Dr. Ranasoma said. The factory was nevertheless being shifted at the request of villagers and customers. Foreign service or family service?